Heel over: Two people perished when the Star of Malta ran aground. Further to my original article triggered off by a request letter of Victoria Pace Ross, who wrote again on March 9 (‘April 1953 sea odyssey’), curiosity could not keep me from delving even further into this mari-time saga or odyssey revolving round the ill-fated Star of Malta sea vessel. Pace Ross asks whether the vessel’s log book was ever retrieved. Well, apparently, even from the records of the September 19, 1955 Maritime Inquiry which had held Commodore Kent as being responsible for the fatal accident, not only does the log book not form part of the inquiry’s documentation, but no mention is even made of it. With this absent, very important piece of evidence one may well wonder how the assessors had reviewed his previous blameless record as a sea captain. Whatever, the log book’s absence could well have been due to the pilfering that went on when the Star of Malta was going down. 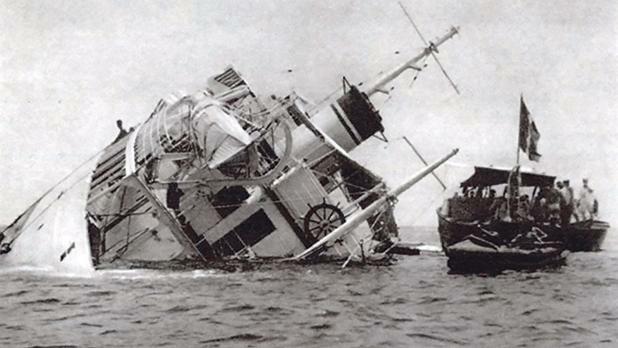 Indeed, it is on record that when news of the accident spread, a flotilla of small fishing and pleasure boats sped to the area to assist, but as the passengers had already disembarked, the opportunity was taken to salvage anything possible. Yet very few items were salvaged. Crates of fresh fruit and a number of cages containing chickens and some other livestock were all pilfered as ‘souvenirs’, beside other valuables. Apart from no mention being made of the log book itself, or its contents, in historian John Buchanan’s study and research in 2009 when he came over to Malta to record any evidence by those involved in the whole chapter, all I could gather on a possible experience like that of Ms Pace Ross’s 1953 nightmarish voyage was one remembered by a certain Edwin Demarco in the summer of 1954, during which he relates that he was on the point of losing his life were it not for the intervention of some sailors aboard the vessel. Another certain Ċensu Muscat has similar vague memories. I have even researched local newspapers published during the period in question and all I could retrieve being reported or photographed about those incidents and ill-fated mishap was when it went down at Dragonara in 1955. Also interesting, in addition to what I wrote in my first article, was what I managed to fish out when I came across a brief write-up by Albert Fenech. It transpires that he had directly witnessed the 1955 accident and had been temporarily employed as a journalist by this newspaper. Born in 1946, Fenech’s family took up UK residence in 1954 where he spent his boyhood and youth before temporarily returning to Malta between 1957 and 1959 and then coming back to Malta permanently in 1965. He spent eight years as a full-time journalist with The Times of Malta before taking up a career in HR management, but still retained his roots by actively pursuing freelance journalism and broadcasting for various media outlets covering social issues, current affairs, sports and travel. I believe that if traced he might be able to recall other interesting aspects of the Star of Malta saga. Finally, I have also traced and identified a very short, but highly prized, news clip from an archived newsreel belonging to British Pathé. This can be easily accessed through the following hyperlink: https://youtu.be/YT3VKH6sSJg. What has recently been written in this newspaper about the subject has positively revived the Star of Malta’s forgotten history. Hopefully, anyone recalling any other unrecorded interesting facts or anecdotes and still living will eventually come forward to add to what has already been compiled here and elsewhere in order to once more consign the Star of Malta episode to its place in history with a complete history timeline.